Apollonir is the legendary Bakugan with four sets of wings and humanoid posture. He is the Leader of The Six Legendary Bakugans. 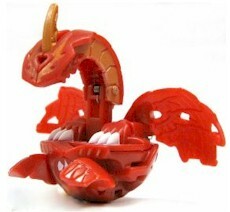 In battle gear, Apollonir is the most powerful Dragonoid Bakugan. Apollonir uses a maximum Pyrus fire blast to eliminate its opponents. It shares a lot of feature like Dragonoid and Ultimate Dragonoid. Purchase Apollonir Bakugan from Amazon now!